For use on 33 Series cables. Adjusting nut for the Berkeley forward reverse cable. Nut for the Steering Tube Adapter on your Berkeley Jet. Used on the steering cable on a Jet or V-drive boat to connect to the tiller arm. 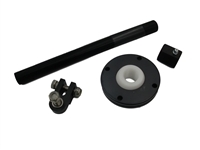 Steering Adapter Tube Overall Length: 9". Steering Extension works great with a Droop Snoot. Steering Extension Kits works great with a Droop Snoot.